With the savvy of foreign policy insiders, Senor and Singer examine the lessons of the country's adversity-driven culture, which flattens hierarchy and elevates informality-all backed up by government policies focused on innovation. 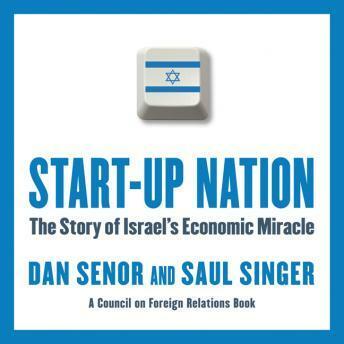 In a world where economies as diverse as Ireland, Singapore and Dubai have tried to re-create the 'Israel effect', there are entrepreneurial lessons well worth noting. As America reboots its own economy and can-do spirit, there's never been a better time to look at this remarkable and resilient nation for some impressive, surprising clues. This book was recommended by a friend as a 'must read' before next summers trip to Israel. I am so glad she turned me onto it. Beside giving me a wonderfully complete historical background it painted a beautiful story of the resourcefulness and ingenuity of the Jewish people. (Of which I am not one) Those factors have shaped the national personality and I feel I am infinitely better prepared to appreciate the people and the new stories I will hear during my visit. Aside from a 'pre-trip read', I would recommend this to any one who loves finance, economics, technology, military ingenuity and old fashioned hard work. I bought copies for my 24 year old son, his friend and my financial advisor. I fear I have made it sound like a dry textbook. It most definitely is NOT. It is quick read that is also engaging and filled with anecdotes that made it a delightful experience. The narration was clear and concise but also wonderfully expressive. I highly recommend you buy and read it.